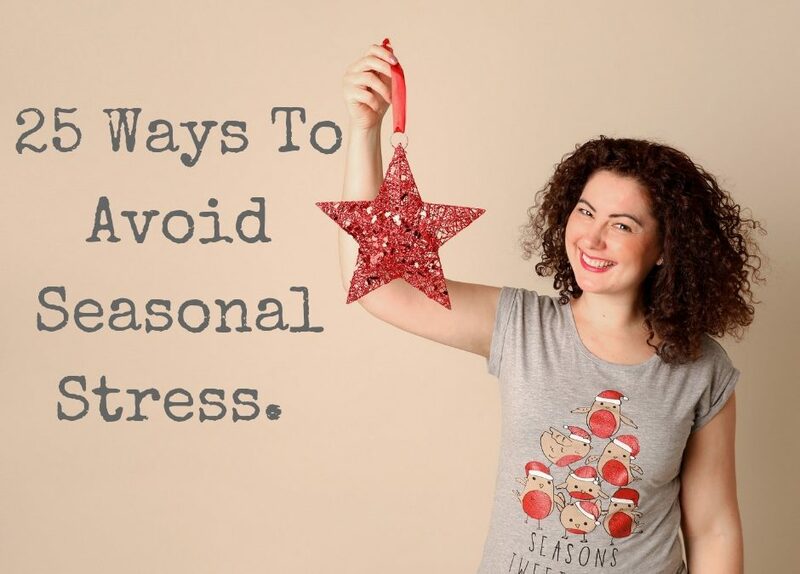 25 Ways To Avoid Seasonal Stress. For some of us, Christmas is a challenging time and often leads to feelings of sadness, loneliness or self-criticism. The long dark nights and stress around the festivities can also result in seasonal depression and anxiety. In addition to this, our expectations can lead to behaviours such as excessive drinking, over-eating, insomnia, frivolous spending, fatigue and over-stretching our time and energy. The pressures of shopping, parties, family obligations, and house guests may contribute to feelings of being overwhelmed and increased tension – especially when inside, you’re secretly not feeling Christmassy at all. So how about avoiding the stress by switching things up this year? #1. Be realistic with your expectations. Don’t get hung up on what the Christmas holidays are ‘supposed’ to be like and how you’re ‘supposed’ to feel and behave. If you’re comparing your festivities to the perfection you see on the TV commercials, it will most likely feel an epic fail. Just take it as it comes. Does the prospect of the usual routine fill you with Christmas dread rather than joy? Do you feel obliged to fulfil all of the Christmas traditions? What’s the best that can happen if you do something a little different? The possibilities are endless! #3. Lean on your support system. If you’ve been depressed, it’s ok to lean on your network of close friends and family. During Christmas, take time to get together with those that lift you up. If you don’t feel up to going out then keep in touch by phone to prevent feelings of isolation. When you start the Christmas season anticipating stress or disaster with the Turkey then this is what you’re likely to attract. Take the festivities as they come (the highs and the lows) and limit your expectations – this way you can relax into it and enjoy. #5. Prioritise the important stuff. What is about Christmas that you really value? Don’t run yourself ragged just to live up to Christmas traditions if they don’t matter to you. So what if you don’t get the outside lights up this year? Be kind to yourself and focus on the things that bring true joy. #6. Give the gift of your time & energy. It sounds cheesy but it’s true. You may feel stressed and booked up already, but consider taking time to help people who have less than you will boost your ‘feel good factor’. Maybe you could do an hour at the local homeless shelter or help somebody with their shopping. It’s easier to figure out the ways in which you can avoid stress when you notice the people or situations that trigger you. If it’s not possible to remove yourself from the situation altogether, practice allowing any negative feelings to come and go. Meditation and mindfulness is a great way to centre yourself. #8. Know when to ask for help. You don’t need to be superman or wonder woman throughout the festivities. Delegate the tasks and let go of any ideas that things must be done ‘your way.’ People are more willing to help out than you think; they just need you to ask. #9. Let go of things beyond your control. So your Christmas cake got a little burnt or the kids are arguing over the games console. Remember your limits: you can’t control them, but you can control your own reaction to the situation. Re-read number 7! People sometimes feel the need to keep family Christmas traditions alive for the sake of it. These traditions may even be long past the point that anyone’s actually enjoying them. How about starting a new tradition instead? Think about what’s aligned to your values and get creative. #11. Remember loved ones in a positive way. Christmas may remind you of the loved ones who aren’t around anymore which can be tough. I can certainly relate to this. You can do something active to celebrate their memory. For instance, hang a commemorative bauble on the tree or toast them over lunch. #12. Know when to say yes – and when to say no. Nowadays, the festivities last for weeks. It’s important to spread your energy wisely. To avoid overwhelm, don’t feel obliged to say yes to every invitation. Think about which parties and gatherings you really want to attend because they feel important to you. Joining in with the festivities doesn’t mean that you have to always be the last one on the dancefloor as the DJ is packing up his equipment. For some parties, it’s ok to just pop in for a couple of hours and head home for an early night or some time to yourself. Take the pressure off and release any anxiety. #14. Spend time with friends that make you smile. If the prospect of the office Christmas party is causing you stress, take along a friend that brings you joy. You can arrive and leave together. Equally, you are not obliged to attend the office Christmas party at all if you’d prefer to hang out with your BFF’s instead. #15. Ditch the notion of the perfect gift. With everything else to consider and manage, the last thing you want is to add the pressure of finding the perfect gift for everybody on your list. Ignore what the commercials say because gift vouchers are not thoughtless – if anything they are more thoughtful than buying a panic gift that somebody didn’t really want or need. #16. Shop online with small businesses. I’m a big fan on this one! You can save yourself time and better protect your energy by doing the bulk of your shopping online. Small businesses have some really unique and personal gifts available. You can also click and collect so that your order is waiting for you at the store when you arrive. Now you have more time to relax and unwind at the end of the day. #17. Stick to a budget. The cost of Christmas mounts up quickly and can make people feel out of control and anxious. Draw up a budget long before you actually start your shopping and stick to it. You can also have fun and enjoy some creative-time making some things for yourself. We all have talents that can be tapped into at this time of year. It’s ok to stick with your ‘normal’ routine during the Christmas season. You are not obliged to stay late at parties or up all night prepping dinner. Maintaining your usual sleep patterns will help you to feel grounded and stabilise your energy. Make time to exercise during the festive period when you can. There’s evidence to suggest that exercise can help prevent anxiety and depression. I’m not talking about hitting the gym. You can easily work some physical activity into your days. How would it be if you walk your Christmas cards to the post office instead of driving? The Christmas period always brings the opportunity to eat excessively. Treat yourself and enjoy the luxuries – just be aware and even out your diet. Eating healthy will keep you feeling well physically and emotionally. #21. Enjoy the Christmas ‘spirit’ – in moderation. Much like the eating, Christmas is also a time to drink excessively. Remember that alcohol is itself a depressant and it can leave you feeling worse. You will also need to drink plenty of water to replenish your body. #22. Make the most of daylight. During winter, we are likely to see less daylight – especially during the working day. This can reduce serotonin levels and result in low mood. Get out of the office for lunch and enjoy some fresh air and daylight. During days off, make the most of the daylight – even if it’s to walk in the rain! #23. Make the most of the dark nights. It’s easy to feel depressed by the long dark nights. Instead you can see it as an opportunity to get cosy inside and spend some time on your self-care activities or play a board game or watch a movie. #24. Maintain your self-care regime. To stay grounded, plan ahead and book in time for you. Maybe an extra therapy session would be useful or a couple of hours quiet time to yourself. Remember, in order to look after everybody else, you need to put your own oxygen mask on first. #25. Cut yourself some slack. Christmas and the New Year can be a time to dwell on imperfections, mistakes and things you’re not proud of. Be gentle with yourself and ride the wave. Go with the ebbs and flow of your energy and mould the season to fit in with you – not the other way around. As lovely as that bottle of designer perfume is, have you ever considered that the best gift that you can give to yourself is to become a better version of yourself? Now is always a good time to set your intentions for the future. If you’d like to explore coaching, start here. 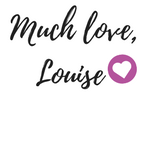 I have enjoyed reading this Louise . I asked my husband if he would like a better version of myself for Xmas ! Wow! Thats fantastic Linda. Good for you! So glad you enjoyed it. I really love this list Louise. Great job. Thank you Damien. Glad you love it. A great collection of Stress reducing tips Louise. Well done and Thank You.